From every leading indicator, the ongoing contract talks between the Los Angeles Kings and Anze Kopitar are nearing the finish line. Back in November, we reported that the new contract was all but done – at what was believed to be a $9.75M cap hit over eight years – with a no trade / movement clause appearing to be the sticking point. This didn’t seem like a major issue and our sources indicated the contract would most likely be announced before Christmas. Then, when several doom and gloom reports started surfacing on Twitter over the past 48 hours, we had multiple sources confirm to us that everything was still on track and there was nothing to be concerned about. 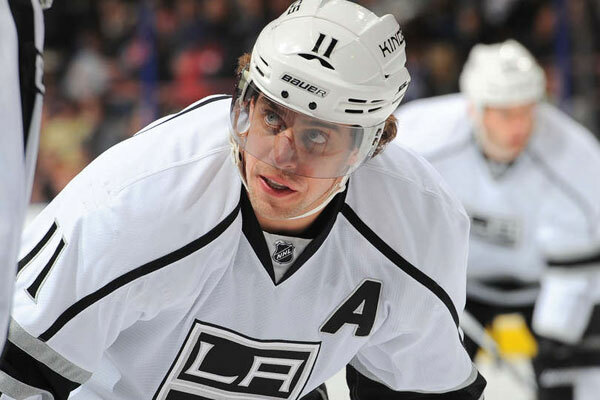 Unless something out of left field occurs at last moment, Kopitar's deal is expected to be that $10M AAV for 8 years. So, what happened, you might be asking? GM Dean Lombardi was resistant to move up to the $10M per year level. While Lombardi has not shared his reasoning, the logic here shouldn’t really require any additional explanation. First off, this will be the most expensive contract Lombardi has ever dished out. Further, as we’ve written about before, from a team perspective, they would be far better off (cap-wise) if the number was closer to $9.0M. However, after several meetings with Kopitar late last year and thinking they had agreed to $9.75M, nothing is really done until the paperwork is signed. 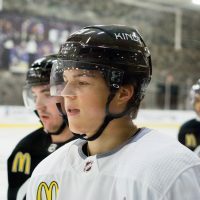 In fact, his recent play helped spur his agent, Pat Brisson, to hold firm on their quest to get the annual number up to $10M. 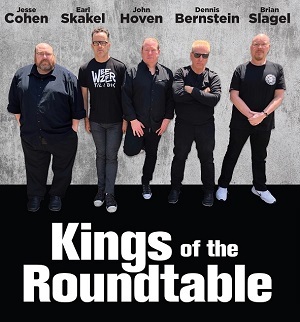 Not wanting to go any higher, and with the drawn out contract negotiations weighing on his mind, we’ve been told Lombardi sought council from his several in his inner circle recently – including Rob Blake. 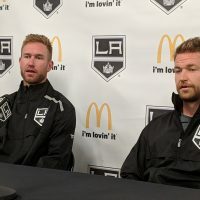 As a former player who went through something very similar, Blake may have helped Lombardi ultimately decide it was better to inch up the money a little and get a deal done, rather than risking Kopitar’s camp entertaining offers from other teams via free agency come summertime. In the end, it was Lombardi’s decision, along with his capologist, Jeff Solomon. These Kings are Lombardi’s team and everybody knows that; he makes the final call in all decisions. Yet, just like he consults heavily with Mike Futa and Mark Yannetti at the draft table – to the point he gives them a lot of latitude toward making key decisions – this looks to be another case where he wasn’t afraid to seek the input of his trusted lieutenants, rather than make decisions in a vacuum. Lombardi has long been credited as a fantastic leader, and such a move would be yet another example of his ability to adapt his management style away from the dictatorships that were more likely used by several of his mentors. Lombardi has constantly preached team, relationships, and family-first. While still being the father figure over the organization, he has shown a mastery of understanding the ever-changing landscape in business and sports management. He hasn’t lost sight of his principles and convictions, while still allowing himself to be a student. While it would have been easy to lean on the fact he is a two-time Stanley Cup winner and knows what he’s doing, he appears to have allowed a little insight from others to help get him to where he ultimately wants to be– back on the parade route, celebrating Cup victories. 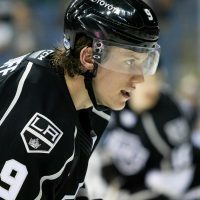 From what we have gathered, there have been ongoing conversations, where Lombardi has tried helping Kopitar understand the value to the franchise with this type of deal (compared to the contracts signed by other Brisson clients, namely Jonathan Toews and Patrick Kane) – where they can keep driving towards getting better – and how this will define the Kings for the next eight years. As for the matter of the no-movement clause, we have received some conflicting information in this regard in the last 24 hours. Some have said this was the final sticking point, others have suggested it was not really much of an issue. We believe the truth is probably somewhere in the middle. Perhaps it was something that hadn’t been resolved back in late-November, was later worked out, but not the final point that was preventing things from getting wrapped up… that was moving the deal from $9.75M to a rounded off $10M. 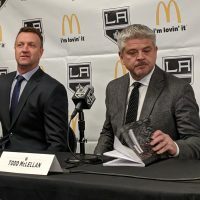 At some point, Luc Robitaille, who has consistently stayed away from the player personal side of the Kings’ house – remember, he is the President of Business Operations, he has no input or involvement on the Hockey Operations side of things – may have helped out, as well. Robitaille and Brisson go back several decades. Once Lombardi made up his mind to agree to the $10M, it was at the very least hinted to us that he may have used Robitaille to help get Brisson to lock thing down. After Lombardi and Solomon did all the heavy lifting, all parties met last night and apparently came away from the talks mutually satisfied. If so, this whole thing was well played by Lombardi and Kopitar. In the end, each got nearly everything they wanted. 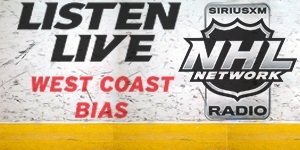 Thank god for this…you trade Kopitar, you trade the Kings! John, I think you mentioned at some point Lombardi was thinking about writing a book about leadership / management; do I remember that right? I’d be fascinated to read it, for all the reasons you articulated. 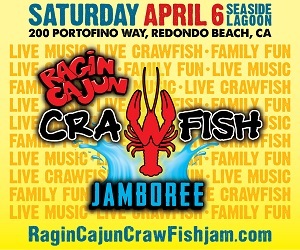 Talked about it on the radio here. And made reference to it here when talking about Lombardi’s legacy in Los Angeles.